Great American Waffle Co sells waffles with about four different toppings at any given time. Staples usually include strawberry and custard sauce, maple sauce, chocolate sauce, along with a seasonal special such as apple with caramel ice-cream, or mango with vanilla ice-cream. The standard flavours cost 410 – 450 Yen each, and the seasonal specials are 700 Yen each. Bear in mind that these waffles are big enough to take up a whole plate, so you get your money’s worth. 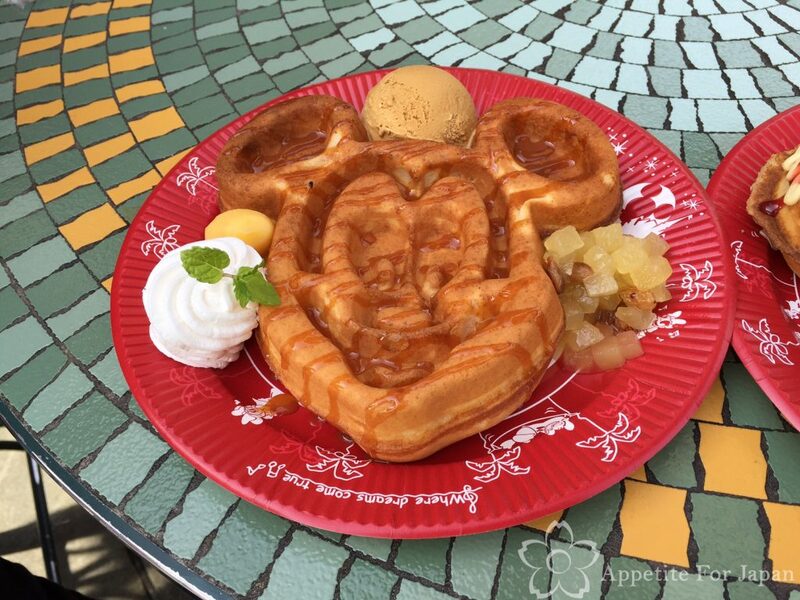 They also sell cups of mini waffles for those who want something Mickey shaped but can’t fit in a normal waffle (460 Yen). 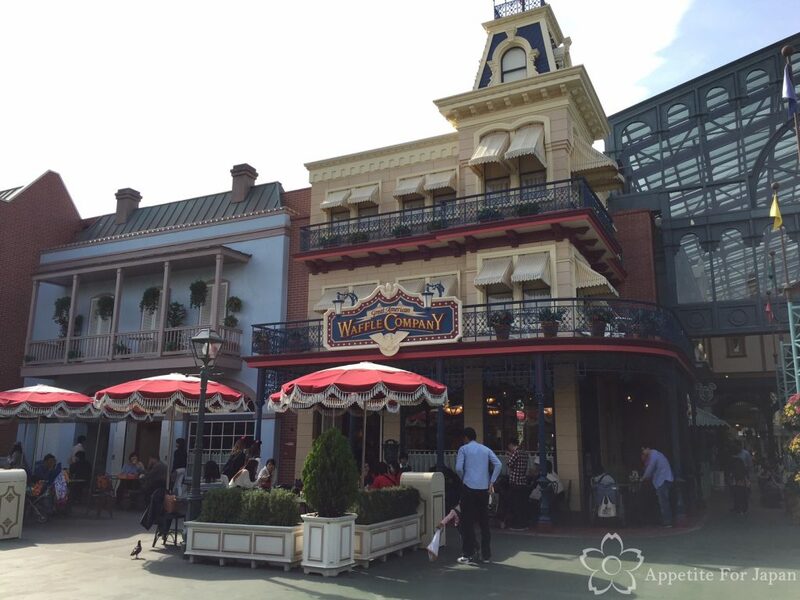 My partner and I stopped by the Great American Waffle company for breakfast during one of our recent trips to Tokyo Disneyland. He had the seasonal special (at the time, this was apple with caramel ice-cream – pictured above) and I had the strawberry and custard sauce. We both felt that the strawberry with custard sauce was the better of the two. In retrospect, the waffles were large enough that we probably should have shared one, given that our idea of breakfast is closer to brunch, and we had a reservation at the Blue Bayou fairly soon afterwards. Next time we’ll probably share one so that we can fit in plenty of other snacks from around the park as well. 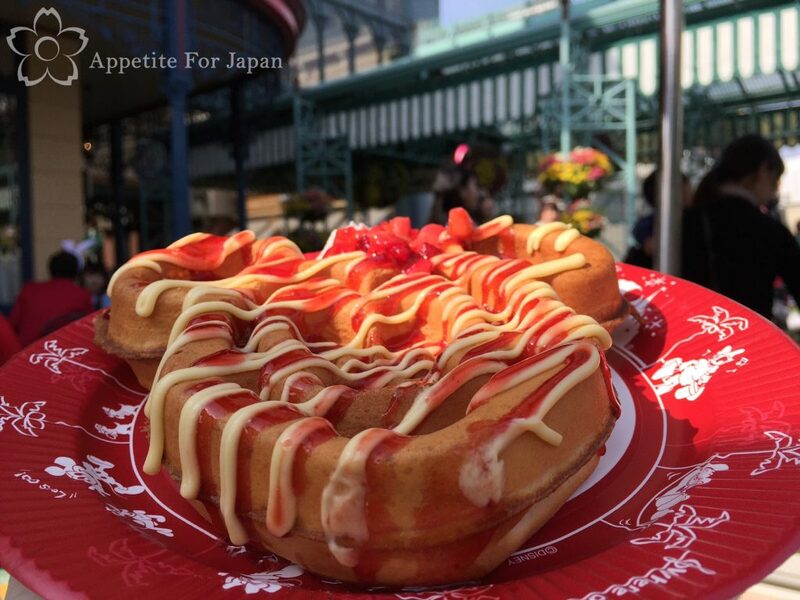 Great American Waffle Co is located within the World Bazaar area. When you enter the park and walk through the main section of World Bazaar (the undercover area where you can see Cinderella’s Castle directly ahead), keep walking until you’ve come all the way through. Then turn left and walk almost as far as you can go (you’ll be walking toward the New Orleans area, near Adventureland). Great American Waffle Co is on the corner. Would I recommend the Great American Waffle Company? 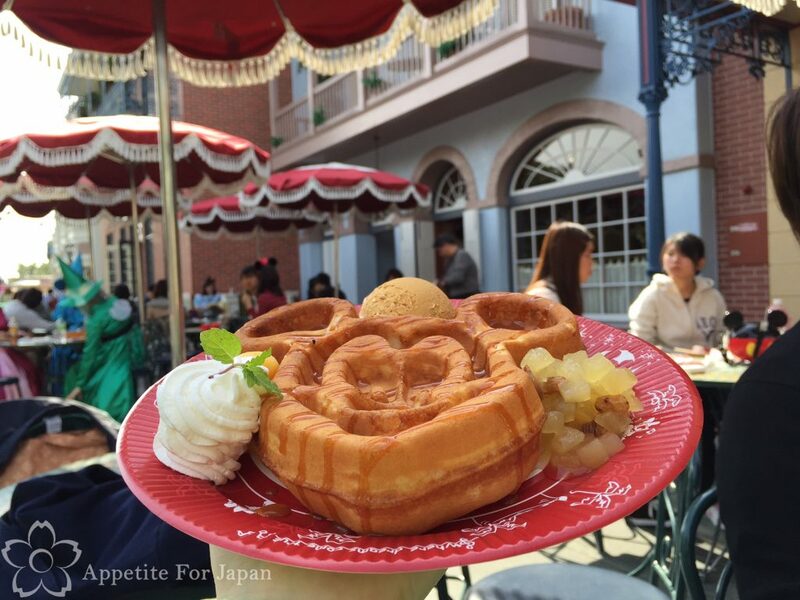 I would definitely recommend Tokyo Disneyland’s Great American Waffle Co. 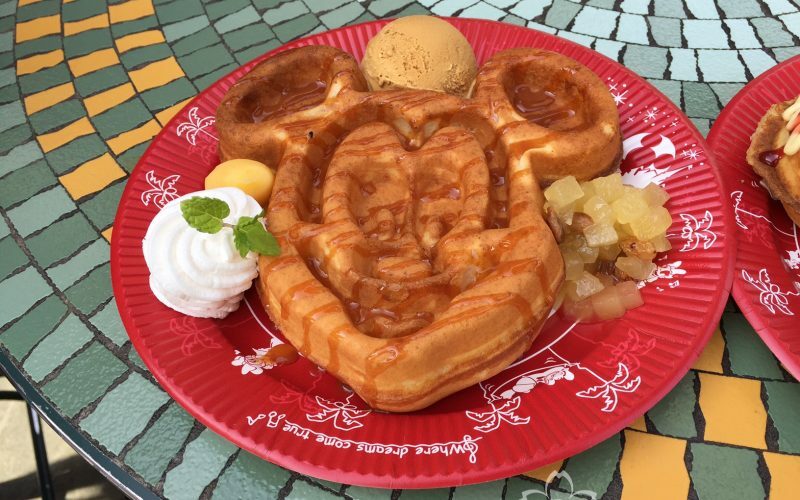 The waffles are freshly made, reasonably priced (especially given their size), tasty, and they’re shaped like Mickey Mouse! What more could you ask for? Okay, some might ask for Minnie Mouse shaped ones, and unfortunately they only have Mickey waffles, but that’s beside the point. 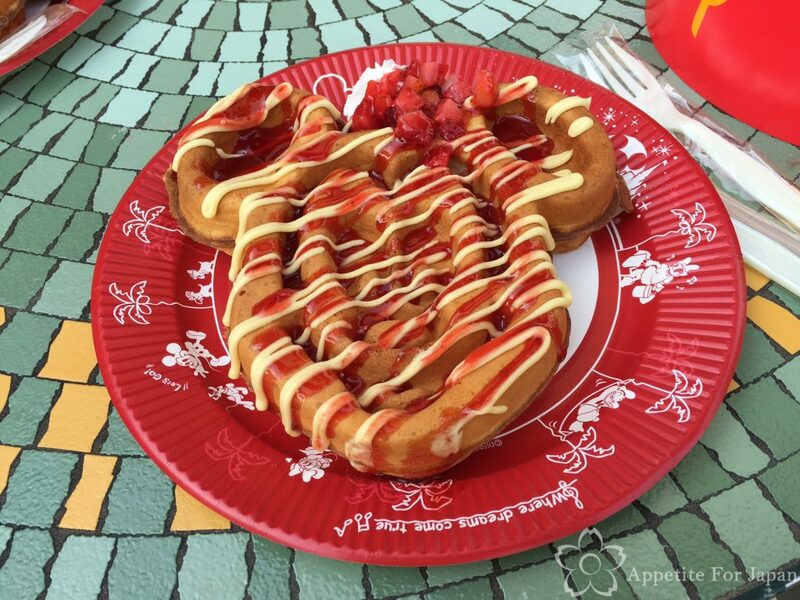 Mickey Mouse waffles are pretty popular, so you can expect to queue up to get one. I recommend avoiding busy periods (such as lunch time) as there are not many tables considering how popular this place is.